Looking for a comfort food-gourmet crossover? Squash can swing both ways. We’ve all enjoyed squash in simple roasted form, but lately squash is branching out. 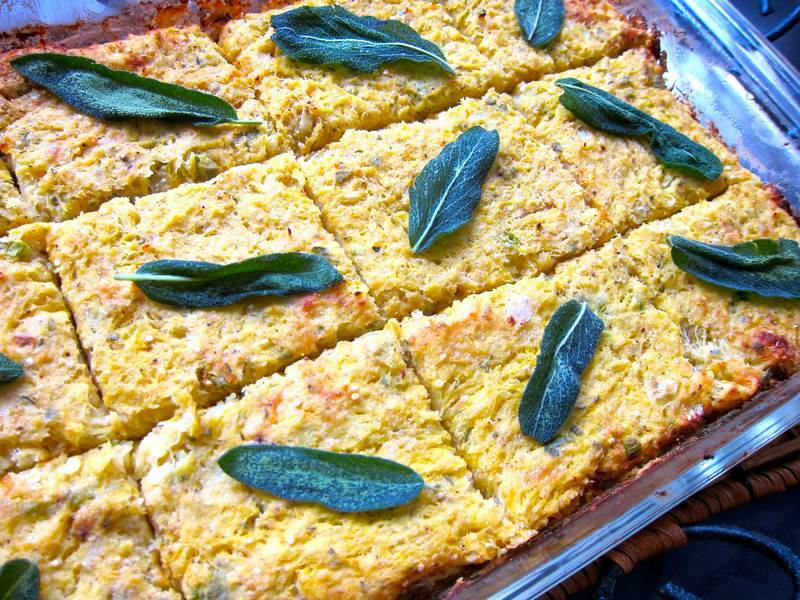 Try these Squash Squares with Sage Crisps and you’ll see what I mean. Cook the squash, cut side down, for 45 minutes, until fork tender. Cool slightly, then scrape out the flesh into a large bowl. Chop and mix roughly using a large spoon. Strain off any liquid. Combine salt and pepper with the quinoa flour. Mix the flour into the squash. Add garlic, chopped sage, scallion, egg and cheese. Lightly oil a 9×13-inch Pyrex dish and press squash mixture in evenly. Cook for 30 minutes or until golden brown. Serve cut into squares and garnished with whole leaf sage crisps. Serves 12. Can be frozen without the sage crisps. Heat a tablespoon of olive oil in a small pan. Cook whole sage leaves for 10-15 seconds, then blot them on paper towels and sprinkle with sea salt. 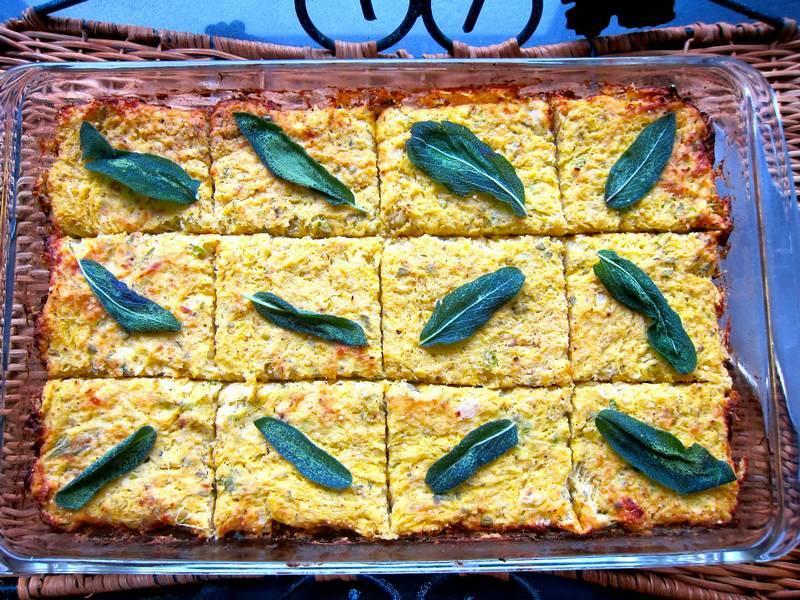 Thanks to Nancy Cox for bringing the wonderful spaghetti squash babycakes that inspired these Squash Squares with Sage Crisps to our holiday potluck. If you are in a hurry and hoping for very crispy squares, you can divide the squash mixture and spread it into two large pyrex dishes. Keep your eye on the time as the squares will cook in 15-20 minutes. What a wonderful idea! I had so far only used spaghetti squash as a replacement for spaghetti, but never thought of using it for making cakes-squares-latkes-etc. Thanks for the inspiration! Thanks Darya! Love getting positive feedback from a veteran foodie!! I like this recipe. Very versitile. I imagine you can use any winter squash and it will be good. Can be a side dish or a main dish for a vegetarian family member. Adding it to my recipe file. Thanks Jovina! 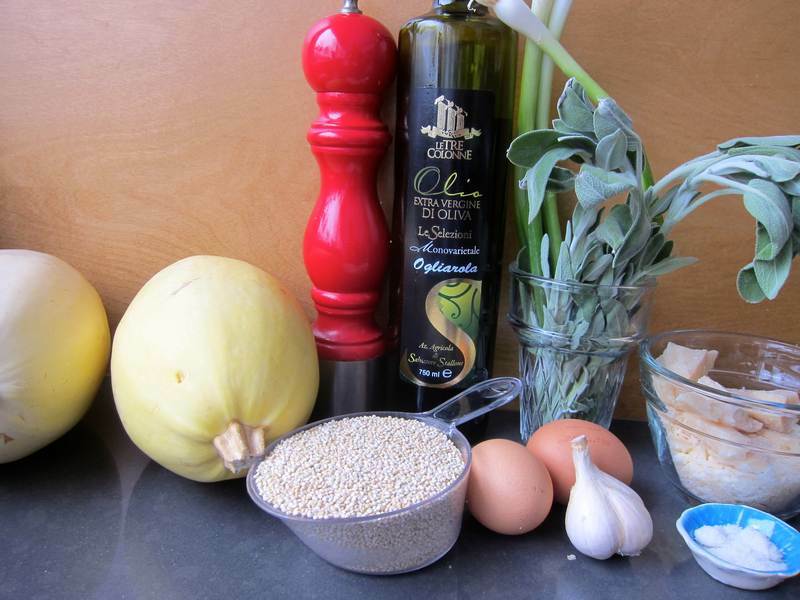 Now you’ve made me curious to try this recipe with several different winter squash. Good word! Yummy & scrumptious! yummy and I like the idea of the ease of preparing in a dish..thanks for the mention! I always try to change the recipe so that the jittery version is different from the original. Thanks for sharing a great starting point!! Looks good — will be trying it with a different kind of squash since I’ve got a bunch in the freezer… Am always looking for new ways to use squash since we always have a lot to store from our garden 🙂 Have been making spaghetti squash pancakes for a while, although the recipe is very different from the babycakes recipe you link to (here’s the one I use: http://www.fabulousfoods.com/recipes/spaghetti-squash-pancakes). Now I can’t wait to try these squares!! There must be a lot of people looking for ways to cook squash. So glad this one adds a little something different to the mix. Thanks for sharing your version. Dear JC, I tried this over the weekend with the fish from last week’s post. The family kept asking for more. Thank you!